Wilma drip irrigation systems are designed to provide high yields in as simple a way as possible and are available in a range of sizes to suit the modern grower, the Wilma has been developed to include. A handy nutrient mixing tap. Easier access to the reservoir. Wilma is a collaboration between Atami and Nutriculture. Why yields are bigger when using a Wilma. The Wilma is like a pot with a personal assistant! The Wilma feeds the plants little and often, which provides the plants with more water and nutrients than if they were hand-watered. When watering once per day you can't give a plant all the water and nutrients it needs for optimum growth because you would waterlog the medium and starve the plant of oxygen. In a Wilma the plants are provided with water and nutrients little and often, so they are able to take up more water and nutrient and they are never over or underfed or watered, so the Wilma produces bigger yields compared with pots. Because of the frequent watering clay pebbles can be used which allow much more air around the roots than any other growing medium - and better access to oxygen = bigger yields. Plants benefit from the accurate feeding of active hydroponics and you benefit from the simplicity and flexibility of growing in pots. The ideal step up from a pot. Golden Rule: Use the correct dripper for the growing medium. When growing in clay pebbles, use the flood drippers. For more absorbent media - soil, coco, grow cubes, mapito - use the arrow drippers. If using clay pebbles treat the Wilma as a re-circulating hydroponic system and top up the tank every few days with half strength nutrient solution. If using an absorbent medium - like soil, coco or rockwool - treat the Wilma as a dripper system with a catchment tank. The aim is to minimise run off and top up the tank with full strength nutrient solution. Use a cleaning product, like Atami's ATAclean, to prevent dripper blockage. Set feeds on a segmental timer: when plants are young start with 2x or 3x 15minute feeds a day when using clay pebbles. Set 1x or 2x 15minute feeds a day when using an absorbent medium. Increase the number of feed periods as plants mature. PLEASE NOTE: ALL OF OUR PRODUCTS ARE SENT IN DISCREET, SAFE and SECURE PACKAGING. ABOUT US We are a bricks and mortar business with our shop situated in Edgware HA8, we strive to provide a customer focused experience providing product ranges for plant growing using many different mediums including organic soil, coco, hydroponics, aeroponics as well as many garden accessories, plant watering systems, indoor grow room tents, indoor plant lighting, organic/hydro nutrients and addatives, fish pond pumps and fountains, air flow kits, silent air flow, soils and coco mixs, gardening accessories and much more. We strive to offer our customers the best service possible. Unfortunately, if we are not aware of an issue, we are not able to fix it. PLEASE NOTE THAT UNLESS OTHERWISE SPECIFIED ALL ELECTRICAL GOODS COME WITH 220v/3 Pin Power Plug Euro Spec. All customers living in the Offshore Islands, Northern Ireland or the Scottish Highlands WILL incur a surcharge determined by our couriers. The following UK domestic postcodes fall into the surcharge bracket. AB31 - AB38, AB40 - AB56. IV1 - IV28, IV30 - IV32, IV30 - IV36, IV52 - IV54, IV63, IV41 - IV49, IV51, IV55, IV56. KW1 to KW14, KA27, KA28, KW15, KW16, KW17. PA1 - PA99, PH4 - PH41, PH49 - PH50, PA20, PA41 - PA49, PA60 - PA78, PH42 - PH44. Unfortunately, we cannot accept responsibility for any damages notified after that time. At Go Grow Hydroponics, we offer an extensive collection of hydroponic equipment and plant nutrients to suit your indoor and outdoor growing needs. We pride ourselves on our extensive collection of hydroponics systems as well as Soil and CoCo medium based systems at competitive prices. We stock items from a huge range of leading brands and have some of the best organic amendments, compost teas and organic growing knowledge in the market ready to share. Alternatively, come and visit us in person at our London showroom, where all of our growing equipment and nutrients are displayed. The Go Grow Hydroponics team will happily assist and educate you to ensure you have the best grow possible whether you are beginner or a seasoned gardener. And because we have been around since 2010, and our team have over 20 years of expertise, you can trust you are dealing with a reputable and reliable company. Other featured products include our organic amendments, carbon filters, environmental fans, grow tents and more. So for unapparelled service and the best Hydroponic Supplies for your indoor growing systems, look no further at Go Grow Hydroponics. We are pleased to serve the whole of the UK, and especially those local to us in the areas of North and North West London, Middlesex, Barnet and Harrow. We also have a blog, where you can read about all things hydroponic. 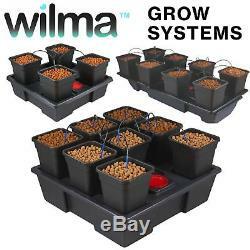 The item "Wilma Grow Systems 4 & 8 Pot / 11L & 18L" is in sale since Wednesday, November 21, 2018. This item is in the category "Garden & Patio\Hydroponics & Seed Starting\Other Hydroponics". The seller is "gogrowhydroponics" and is located in Edgware, London. This item can be shipped worldwide.